It’s hard to believe these stairs have been in limbo since March when we tore out all the carpet and hand rail in anticipation of getting a new one–see this post for those details. 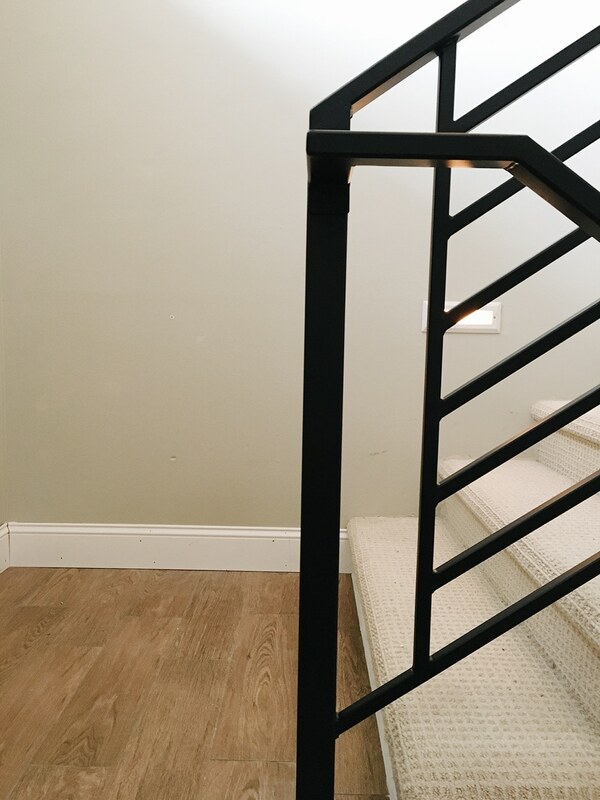 Although, that span of time was never the plan and I would never recommend going 7 months without a handrail (like, ever), now that we’re on the other side, and we all survived, I’m just happy it’s in and can’t wait to share with you all the details today. Designing this railing was only as hard as choosing between a vertical and horizontal railing, which I went back and forth between for some time. I pinned inspiration images like crazy and ultimately decided in the 11th hour that horizontal was for us. I added one vertical portion at the stair landing–a small but lovely detail. Speaking of the stair landing, just last week, before the install, we decided to swap out the carpet for more of our faux wood tile that runs the span of our main floor. 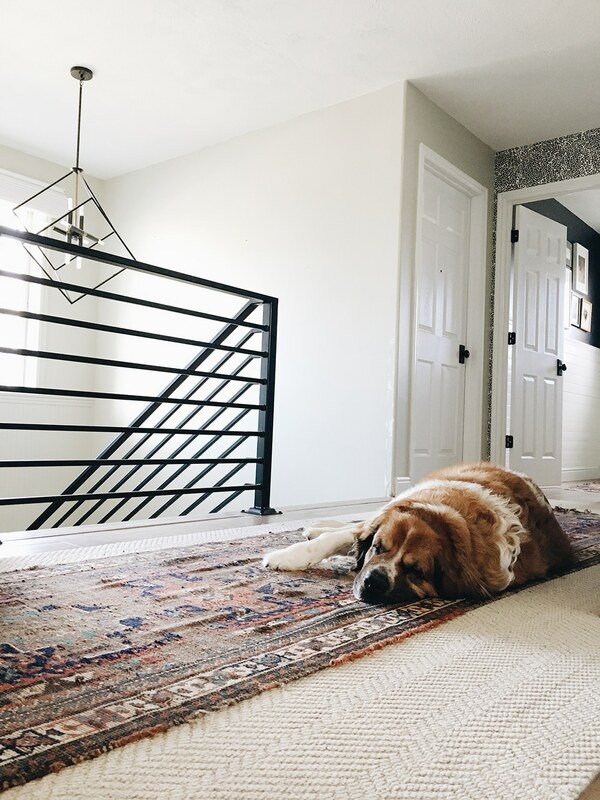 While the rest of the carpet on the stairs and downstairs has been holding up great, Charly loves to sleep on the landing at night–where she can keep watch on her whole family– and the carpet is impossible to keep clean in that spot. We have plans to lay an area rug for her–one that I can easily and frequently throw in the wash so she can still enjoy her spot, but we’re all enjoying the ease of cleaning it for now and I like the look, too! Many of you know, we did have trouble getting this job done–hence the 7 month delay. I had a specific vision in mind of what I wanted and it wasn’t something we could DIY so it was something we had to hire out. Many contractors came and gave us an estimate and then would never come back! It was frustrating, and reminded me how much we love doing things ourselves and being in full control of the timeline. 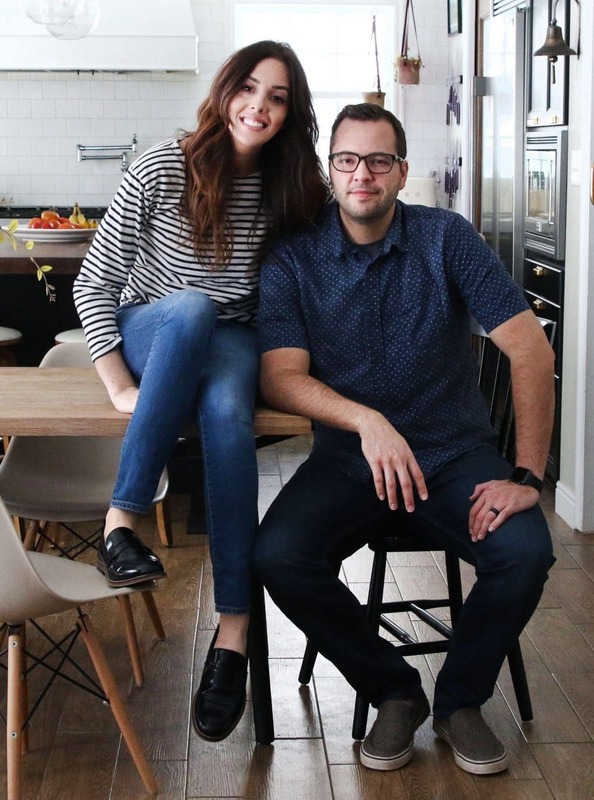 But I know we’re not the only ones that have to deal with those renovation setbacks. For those that are interested, ultimately, we used Rocky Mountain Fabrication & Construction and we’re in love with the results. They came in for a consult measurements. I showed them pictures and they asked me some specific questions on how thick I wanted the different railings. A few days later, they brought in large sheets of plywood to map out the dimensions and about a week later, they brought in the railings for a dry fit before they were powder coated. I was so nervous to see them that first time because the original consult was pretty brief and I worried about my vision coming through. But they nailed it. A couple days later, they were installed. The fabrication and Installation together cost $1500–which I think is very, very reasonable. 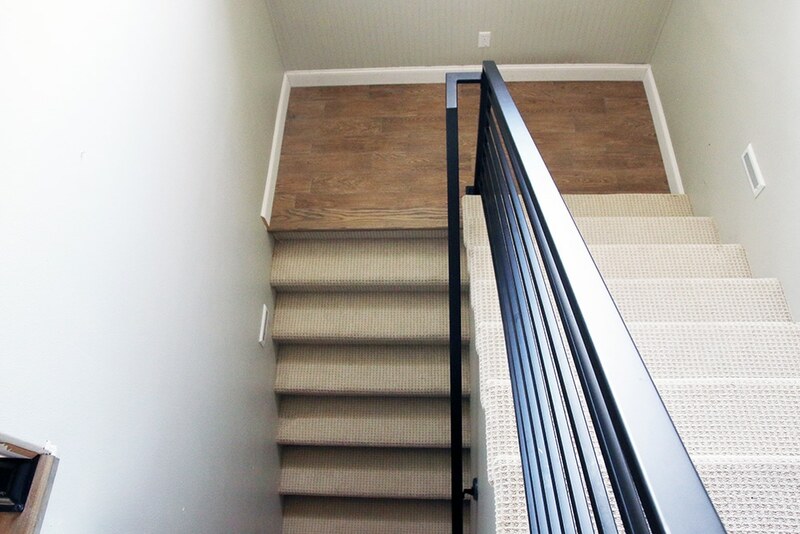 While everything is made from tile, the stair nose is actual wood stained to match the tile. In these pictures, you can kind of see how there’s a tiny lip bowing up in between the where the rails and screwed down. It isn’t noticeable in real life and we were assured it would eventually settle in, but after seeing these pictures, I might go put a stack of books on it! As for any fears about the kids “climbing these like a ladder”, it hasn’t crossed our minds because it hasn’t crossed theirs. I have a friend that has a child that will climb anything! Our girls just aren’t like that. That’s not to say they never will, but right now, it’s not a concern. We just survived 7 months of no railing, so we’re feeling especially safe and secure. Haha. …and got a new light nearly 2 years ago. 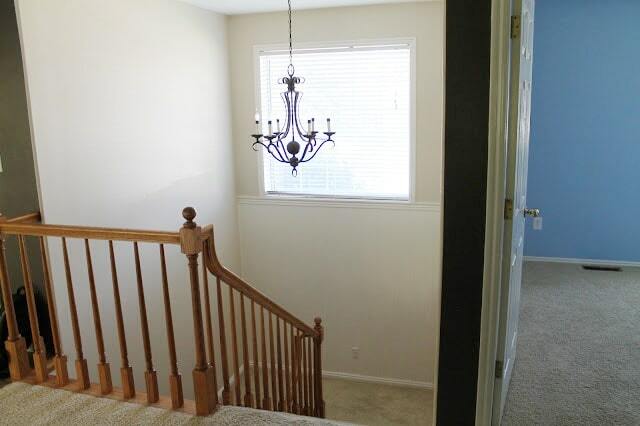 But although we still love this fixture, we originally got it to balance out the ultra traditional banister. So I think now we’d like something that is a little more traditional/organically shaped to balance out the sleek railing. The railing really has changed the whole vibe of the house. It feels more like us and fits in better with the rest of the choices we’ve made around here. 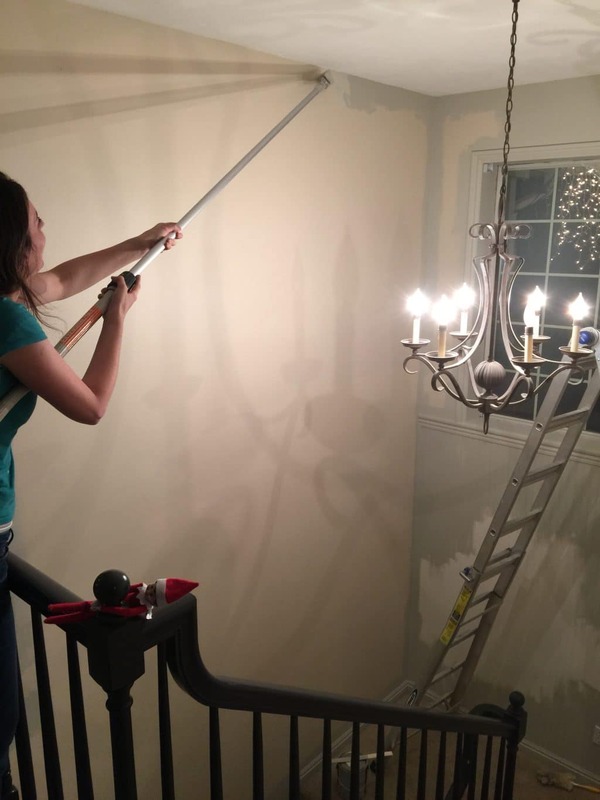 I had this vague idea that, before we dove into this project, that a stair railing would be closer to $3K+, but this felt affordable and like something anyone could save up to do to update their home. Is there a new railing in your future? Or if you got one recently, it would be fun to share the cost, your region, and even a link to a picture if you got it in the comments! We’d love to hear and share different experiences. Ps. The pretty new runner on top of the FLOR squares in our entry is from The Vintage Rug Shop. I love the railings. I love the look of steel and how sleek vine. I love this !! And need it !! What do I ask for … a welder a stair railing builder ?? Was your whole project 1500.00 ?? Hi. I know I can keep looking and find the answer somewhat. A) where are you located and B) did you need an inspection as we were told horizontal stair rails wouldn’t pass code? We’d love the horizontal rails so are looking at solutions. We’re in Idaho, and no inspection was required. But that could be different other places so you’ll definitely want to check with your city building commission. Do you have contact info for Rocky Mountain Fabrication & Construction? I’d like to hire them to build a railing for my home in Jackson. Thank you! We don’t have a contact! Just called the office ourselves. Love, love, love, love this! We’re about to do it for our new build. I see that the posts are 1.5″ and rails are 3/4″, but is the top rail slightly thicker? That’s amazing handrail, it really looks great and awesome. you have a good taste. I surely love this design of yours, thank you for sharing this one. We had it custom built from a local metal fabricator. That railing is fantastic. You guys knocked it out of the park! Love the railing! We did something similar, but I feel it looks too tall for the space. Can you please tell me the height of your railing? We are obsessed with this railing. 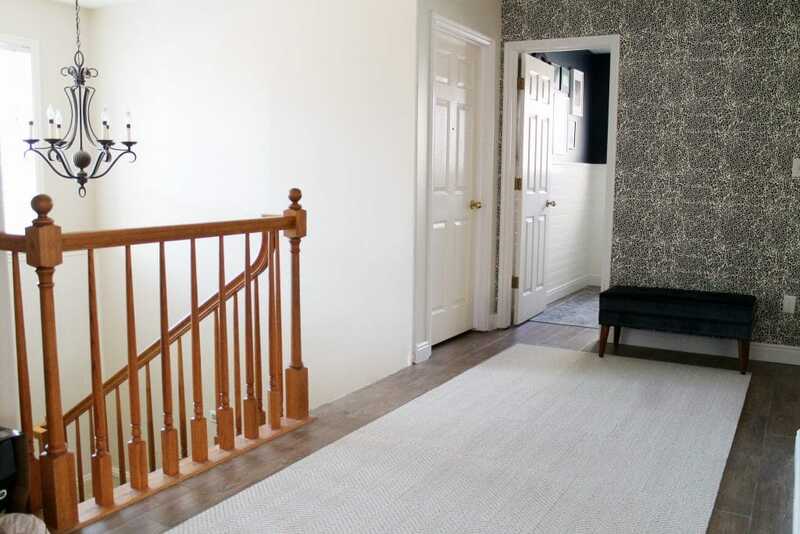 We recently purchased a home and one of the first projects on our list is to replace our banister with something similiar. Unfortunately the pricing we received for the exact design as yours, powder coated, at 35 linear feet, was 8-10k! :( anyway I’m commenting here for anyone else interested in something similiar it was a rude awakening when the quotes came in verses the $1500 mentioned in your post. My quotes were way higher in South Carolina as ! And I have tried a few places ugh! I love your railing! Can you please tell me if it’s black or dark gray? How was the railing posts connected to the floor? LOVE the railing!!! We are getting ready to do this in our house. I know it was powder coated but do you know with what finish satin or flat? Thanks so much! Also are aall the railings square or round? It’s flat, but there is a slight sheen to it. The railings are squared off. I would go for a vertical one because in that case, kids can’t climb on it. Maybe in the future. This is amazing. It is exactly what I was envisioning for our new place. Do you have the measurements of the width of the railings and the posts? We need to provide it to the contractor. I would really love to know all the details on what exactly you purchased. We are looking to upgrade ours too. I love this! 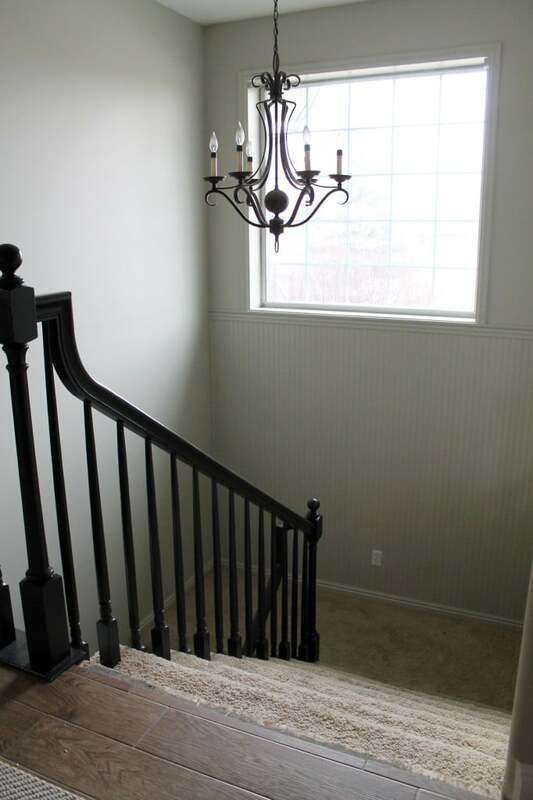 I have been waiting installing our banister as well because I can’t find anything I like… but this I love! Can you share the dimensions (thickness) of the railings and newel posts? I absolutely love the horizontal railing! I’ve looked into doing this but got discouraged as it’s nearly impossible to meet code having horizontal spindles on the guard rail where I live in Canada. It seems like the rest of the world doesn’t have this issue (or at least knows how to work around it)! Such a bummer as it looks so beautiful. Did the contractor do the wood stair nosing? The color match is spot on! Looks gorgeous! But I really feel that it would look so much better without the carpet, your floor is beautiful and everything will come together more modern! My humble opinion. Looking at your house photos it feels like every design decision was effortlessly made in good taste. Hearing about your struggle makes such good home styling look less unattainable – though good taste is still needed to achieve such results! Everything flows so beautifully in your spaces, kudos! Can you please say what FLOR squares you used in the hallway runner (the herringbone white one)? I think I found the style (Roadside Attraction) but none of the colors look as good as in your photos. Beautiful railing!!! I’m also really digging the light fixture! Just beautiful. The new railing just transforms the space. I’d love to see a Nelson bubble lamp over the staircase, the contrast would be gorgeous. I’m curious, are you going to be reinstalling the baby gate you guys made? Does it still fit with the new railing? I like this railing so much! I hope to do a similar one in a few years when we (hopefully) are ready to renovate our main floor and kitchen. Gorgeous! Your railing looks perfect! It’s such a great fit for your house. Beautiful!! 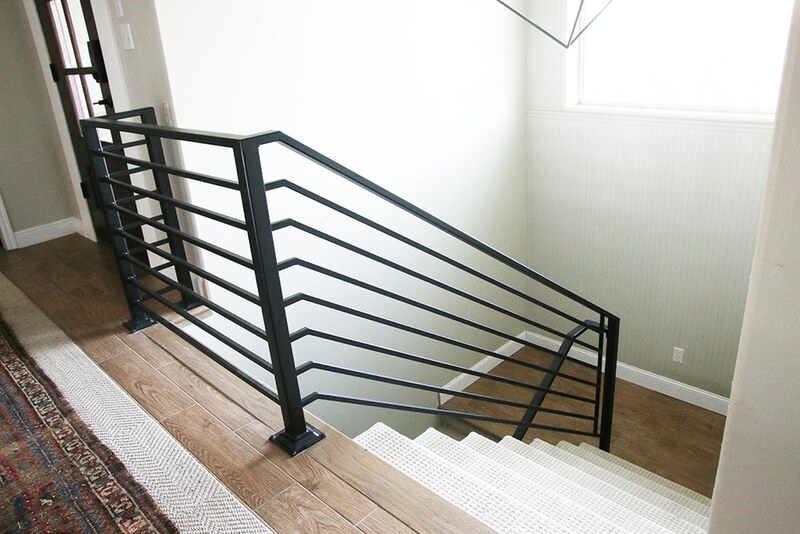 I have no idea how much railings should cost, but my husband welds & I know how much materials + work + powder coating that railing would take so $1500 totally sounds like a steal :D Also, thanks for the tip about using tile with a wood stair nose for the stair transitions. We’re planning on doing wood tile on the first floor but we also have a stair landing for the first step that our pup likes to sleep on so that would be a great transition for us to have too :) You guys are always an inspiration! It looks amazing in your home, and the tile landing is the icing on top! We grabbed a few quotes for a small steel staircase off the back of our house, leading down to our patio. 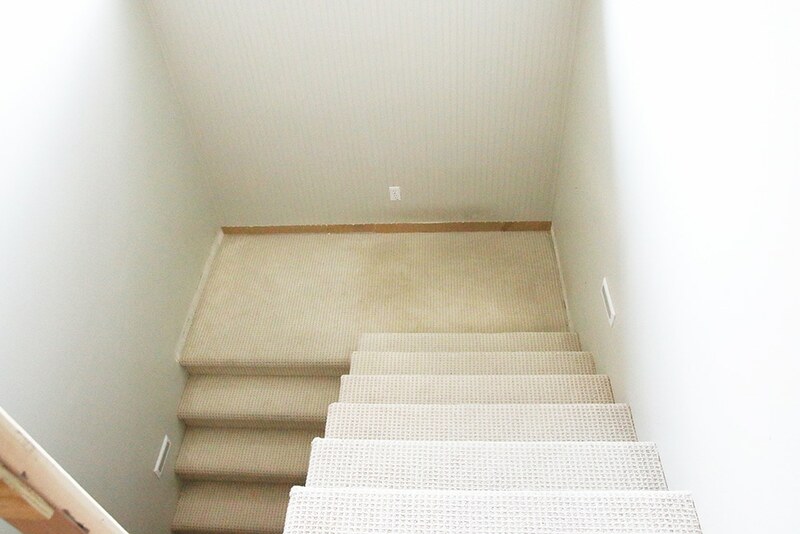 Of course the quotes included the stairs, too, but they were 5 times higher than your price. We were going to do horizontals as well, down to the same vertical detail you have! Honestly, it would have been worth it though, had we not ran into issues where we had to add new siding to the whole back of our home, ha! I’m thinking something close to this would look great on our front porch! 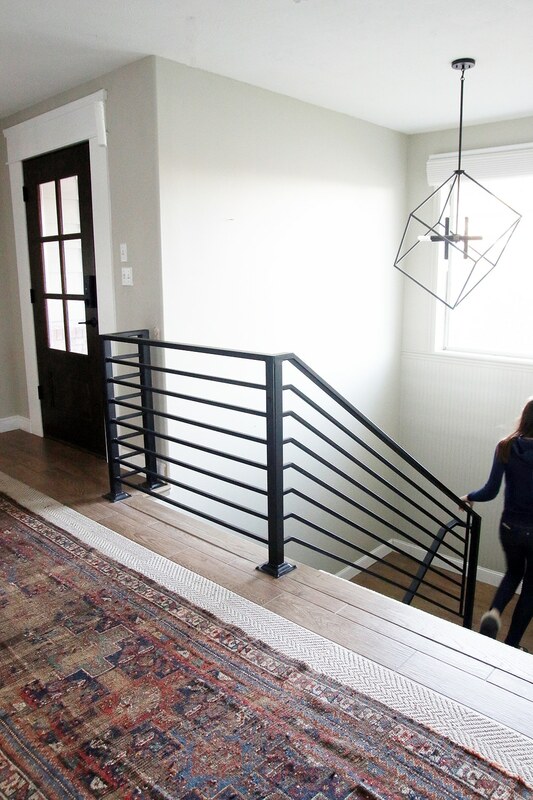 Jules, it looks incredible – the stair railing of my dreams! I love the ultra modern look and can’t wait how it’ll look juxtaposed against a more traditional light fixture! It looks great. Your right it matches what you have done soo much better. We had a very similar railing (put in by the previous owners) in our old house (1966 split-level) and we loved it. Yours looks amazing! We just replaced our old wrought iron banister with a wood, craftsman banister. We paid $800 in materials, $400 for install and painted and stained the wood ourselves. ours only includes the top floor barrier and a single handrail down the stairs. Considering yours is so much more extensive, $1500 sounds like a steal! I love how the new railing relates to the horizontal planking in the nearby bathroom. Very nice! Even though it took months, I really like what you landed on in the end. 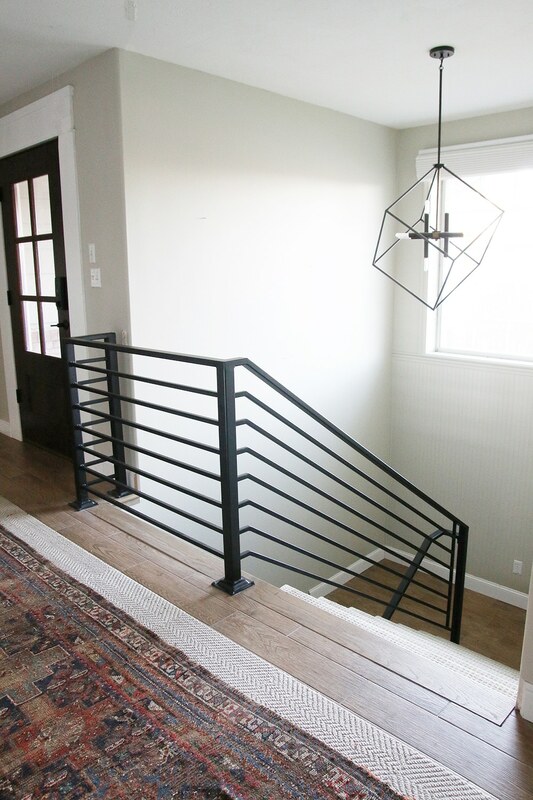 We re-did our railing and I am in love with the results – very nontraditional. Looks amazing and completely transforms the feel of this space! Excellent choice on the horizontal railing. It is perfect for your home! I like it! I hope you don’t get too much backlash over the potential for the girls to climb the railing like a ladder. They will be fine. You know it, and I know it. We have four kids, (3 boys, 1 girl), and they all would have climbed it. We would have parented them through that phase, and if it comes up in your house, I know you will too. We have been wanting to change out our railing for a couple of years now but we can’t quite decide exactly what we want. So the ugly one still stands. This may just be the inspiration we needed. Beautiful job as always! Wow! Looks great. I’m so in love with steel railings. Can you please show us the view from the bottom looking up? While I love and admire the railing, I’d love to see the whole thing, not just the section on the first floor. It looks like it’s just a normal handrail on the bottom section! (Like what you’d have against any wall).